Because mandalas are supposed to represent the impermanence of life and futility of attachment, sand mandalas are traditionally swept up after completion and scattered into a nearby river or lake as a blessing; many people find this to be the most moving part of the ritual. The process of creating sand mandalas can take many hours of hard work. However, the experience is therapeutic and provides an opportunity your mind chatter to stop. Although sand mandalas are traditionally made by groups of monks in Tibet, the solo experience is just as rewarding. 1. Lay a square board (of any size) onto a flat, large, stable surface. You will be working from above. Also make sure that the area you are working is free of potential breezes. 2. Find a design or create your own to be reproduced in sand. 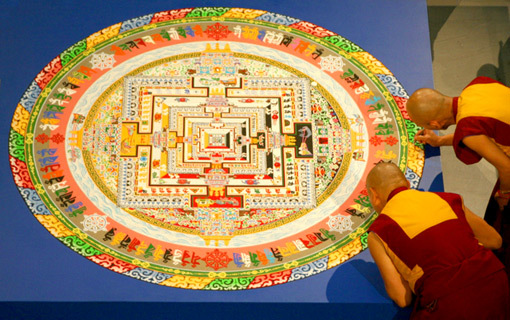 You can find examples of Tibetan mandalas in art books or websites. 3. Carefully draw your design on the board. 4. Scoop out the color of sand you wish to use for the background of your design with your funnel. 5. Lay down the sand where you wish that color to go, by gently tapping the side of the funnel to cause the sand to flow precisely onto the board. 6. Continue to lay down the design, one color at a time. It is best to complete the center of the mandala and work outwards. Continue until all the elements of the mandala are complete. 7. Begin removal of the mandala when you are ready. Following tradition, destroy the deities and symbols by pinching the sand in a particular order. Then draw lines from the four directions into the center with your fingers. 8. Sweep the sand into a container with a brush or hand broom. Continue until the surface is clean. 9. Return the sand to nature. Traditionally, the sand is poured into a river or lake. The materials are never used a second time.